Nicole Fitzhenry-Dawes’ wedding day is fast approaching, and what she should be focused on is the last-minute details like dress fittings and cupcake tastings. Fair Haven’s chief of police is missing and another Fair Haven PD officer has been brutally murdered. Nicole and her fiancé, Mark, believe the two events have something to do with the Chief’s investigation into the possible corruption within the Fair Haven police department. He had to be close to uncovering the truth. When evidence starts showing up that implicates Mark as the mastermind behind the corruption, Nicole knows she has to investigate, otherwise she might be taking her vows through prison cell bars. But doing so will bring her directly into conflict with the worst criminal she’s yet faced—one who’s willing to do anything to remain anonymous. 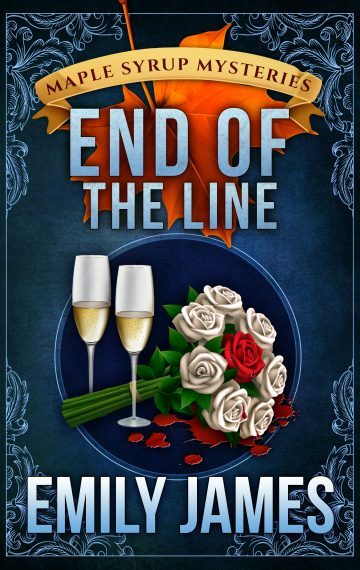 End of the Line is the ninth and final book in Emily James’ Maple Syrup Mysteries. If you love small-town settings, quirky characters, and a dollop of romance, then you’ll want to buy this amateur sleuth mystery series today!